Hotel polyester cotton fitted sheets. This luxury bed linen has a balanced combination of tightly woven fibres to compliment the natural softness of the cotton and the easy care of the polyester, making it different to other bed linens. Durable 50/50% polyester-cotton. 140 Thread Count. For mattresses up to 9" (23cm) depth. Available in Single, Double, King and Super King sizes. Fitted sheets are available for up to 12" (30") deep mattresses at extra cost. Available in White. Pastel Colours - Peach, Lemon, Pale, Blue, Pale Green, Pastel Pink and Latte. Deep Colours: Mid Blue, Mid Green, Rose, Burgundy, Red, Black, Chocolate, Navy and Silver. Matching duvet covers, flat sheets, valances and pillowcases available. 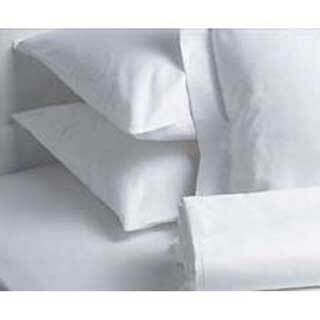 Polyester cotton percale hotel fitted sheets. This luxurious soft quality percale, 180 thread count (180 threads per square inch), is made from extra fine combed yarns, making this fabric soft with the feel of cotton, but easy care. 50% combed cotton 50% polyester for blissful comfort. Due to a denser weave the fabric feels smoother and softer. Life and durability is increased due to more threads per square inch. A modern luxury non-iron finish. 25cm (10") Deep Box. Catherine Lansfield luxury sateen hotel fitted sheet 500 thread count cotton rich. 70% cotton 30% polyester. This luxury 500 thread count bed linen is made from the finest cotton rich yarns. Plain design. 32cm (12.5") Deep Box. This fabric is smooth, silky and becomes softer with every wash. Available in white, Cream, Grey and Natural. All cotton goods will shrink approximately 6% on weft (width) and up to 8% on warp. This fabric is smooth, silky and becomes softer with every wash. Available in white, grey, natural and cream. Catherine Lansfield polyester/cotton percale hotel fitted sheets. This luxury quality percale, 180 thread count (180 threads per square inch), is made from extra fine combed yarns, making this fabric soft with the feel of cotton, but easy care. Colours available:- White, Cream, Natural, Cornflower Blue, Black, Duck egg, Red, Hot Pink, Plum, Navy, Lilac, Grey and Heather. 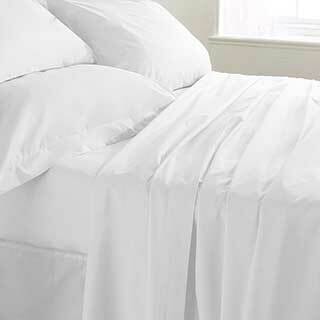 Polyester cotton percale extra deep fitted sheets in white. This luxurious soft quality percale, 180 thread count (180 threads per square inch), is made from extra fine combed yarns, making this fabric soft with the feel of cotton, but easy care. 50% combed cotton 50% polyester for blissful comfort. Due to a denser weave the fabric feels smoother and softer. Life and durability is increased due to more threads per square inch. A modern luxury non-iron finish. 36cm (14") Deep Box. Extra deep box to fit mattresses up to 14" deep. White and Cream available. 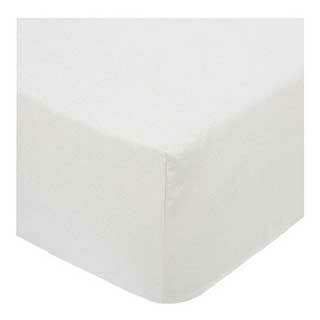 Polyester cotton percale extra deep fitted sheets in cream. This luxurious soft quality percale, 180 thread count (180 threads per square inch), is made from extra fine combed yarns, making this fabric soft with the feel of cotton, but easy care. Hotel fitted sheets with extrea deep box 100% Egyptian cotton 200 thread count. 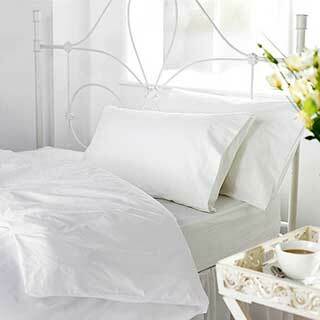 This luxury 200 thread count bed linen is made from the finest cotton yarns - 100% Egyptian cotton. 36cm (14") Deep Box. This fabric is smooth, silky and becomes softer with every wash. Available in white. 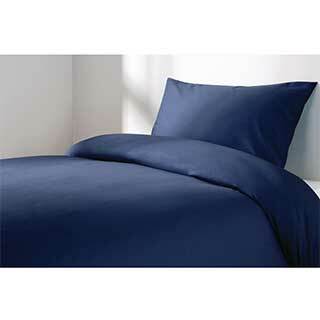 Luxury polyester cotton percale fitted sheets. This luxury 50/50 polyester-cotton percale bed linen is woven from the very finest yarns. This easy care luxury bed linen has 180 thread count. This fabric requires the minimum ironing, but has the feel and softness of cotton. Available in single, double, king size and super king size. Depth: Approximately 12" (30cm). Elasticated on all 4 Corners. 50% combed cotton 50% polyester for blissful comfort. Due to a denser weave the fabric feels smoother and softer. Life and durability is increased due to more threads per square inch. A modern luxury non-iron finish. 30cm (12") Deep Box. Luxury 100% Egyptian Cotton Percale 200 thread count fitted sheet with 40cm (16") deep box. This luxury 200 thread count bed linen is made from the finest cotton yarns - 100% Egyptian cotton. Plain design. This fabric is smooth, silky and becomes softer with every wash.Available in white and ivory.